One of the nice things about rooming with K for the Summer is getting to make dinner for two! He has a CSA (community supported agriculture) membership, so we have a weekly influx of fresh produce (lately lots greens). This means lots of summer salads for dinner because they're quick & healthy to whip up! 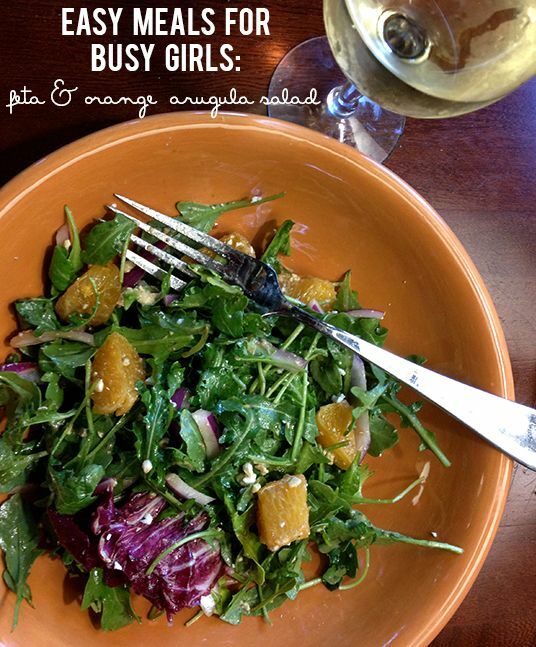 This feta, orange, onion & arugula salad is the perfect mix of flavors made even better with a homemade vinaigrette. I was inspired by Jocelyn's DIY salad dressing recipes in LPF Mag. Mandarin Oranges (slice in thirds). I love the idea of making salad dressings from scratch instead of buying premade. They're so much tastier have less preservatives & are more cost effective (I mix mine up in a mason jar and shake all the ingredients up). Be sure to check out Issue #3 of LPF Mag for more DIY salad dressing recipe ideas to make your own! MMMm the oranges sound delicious with the feta and balsamic! This looks so delicioues! I've been trying to get Tom to join a CSA fo the summer! Do you love it? Pro con it for me! i am making this tonight, no joke! i bought arugula and don't know what to do w/ it haha!! I am absolutely going to make this on Thursday! I need to experiment more with making my own dressings - I'm also so jealous of your CSA. I'm looking into one so I can eat a LOT more veggies and support local farms. Seriously, I can't wait to make this salad for moi + Ed now! Summer Steals // Fashion Finds for $30 or Less! Beach Bums + Butter Beer!